The fishing has been very good on the west coast lately. Good hauls of gurnard and the odd big snapper are being taken by kite fishers at Muriwai Beach. 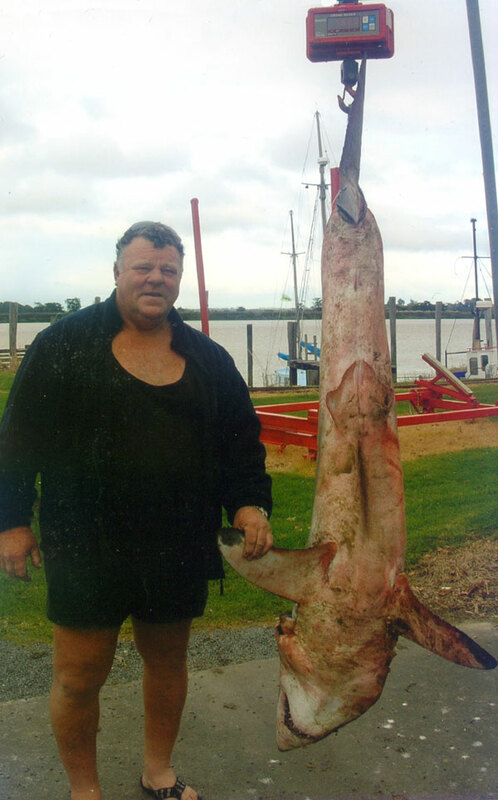 Snapper up to 10kg have been reported from the Dargaville coast and a white pointer shark was recently taken. So don't let the fact that it's winter put you off kite fishing. Most of the biggest snapper are caught between July and November on the west coast. On the 14th June Colin Sherman was kite fishing 30km south of Bayly's Beach in strong north easterlies. On his first set to 1000 metres out he knew he had caught something big by the huge load on the mainline. It took Colin 1.5 hours to haul the line back to shore. When he first spotted it in the surf he thought he had hooked a seal but then realised it was another white pointer shark. Yes, that's right, ANOTHER great white shark! Unbeliveable as it may be Colin caught a smaller white pointer around 10 years ago on a kite longline rig. With the thousands of kite and kontiki fisherman in New Zealand I am only aware of these two great whites being taken over the last twenty years by anyone fishing from the shore. The shark was hooked on two traces in the mouth and one in the tail. As sharks do it had spun until and the mainline was tightly wrapped from head to tail and because of this was towed in backwards. The shark was dead when it arrived back at the beach. Recently the New Zealand Government passed laws protecting white pointer sharks. The Wildlife Act now prohibits targeting of white pointer sharks out to the 200 mile economic zone. Penalties are very severe with a fine of up to $250,000 and up to six months imprisonment as a maximum penalty. At the introduction of the new laws Fisheries Minister Jim Anderton said the white pointer shark was not known to be targeted by commercial fishing but was occasionally taken, unintentionally, as by-catch. Mr Anderton also said they were sometimes targeted by recreational fishers and there was some demand for jaws and teeth as fishing trophies. Others were unintentionally caught in set nets. “No one wants to see an animal hunted to extinction for the sake of a jaw or a few teeth or to be placed under pressure by accidental catch. Under these new regulations no fisher will be able to profit from taking a white pointer, and any fisher inadvertently catching one will have to return it to the sea, intact, and alive, if possible,” Mr Anderton said. Click the following link to see the latest forecast update from Buoyweather they have recently upgraded their service and are certainly worth checking out.